Are you ready to transform your career, your life, or your business? Are you interested in making a career change or starting a business/consulting practice, but don't know how to get started? Do you want to explore what your life purpose is, so that you can create a "Mission Statement" for your life? Over the years as a recruiter, career coach and résumé writer, I've seen the consequences of poorly written résumés. Unfortunately, many don't seek professional career help until they experience the frustration of a long and fruitless job search. For most, their problems began by committing the top five résumé mistakes: lack of focus, absence of marketing strategy, no accomplishments, lack of keywords and incorrect format. Avoid those mistakes by following these five simple résumé rules. What an immediate impact we could make if each of us decided to spend our business and consumer dollars on women-owned businesses - to find a coach, consultant, software vendor, dentist, conference-call vendor, phone service, computer and so on from a woman! This is what the WITI Marketplace is all about. There are over 100 women-owned businesses in the Marketplace so you don't have to search far to find the products and services you need! Search the Marketplace today! 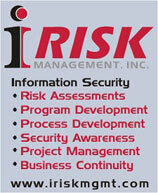 Featured Business: IRisk Management, Inc.
IRisk Management, Inc. is an independent information security consulting firm that focuses on assessing corporate-wide information security risk and implementing security programs, which includes developing policy and procedures, security awareness programs, and business continuity planning. We also offer "Chief Security Officer On-call for small companies who may not have a Chief Information Security Officer. For WITI members: 15% discount or a 15% referral fee thru 2004. The "WE DECIDE!" National Voter Registration Drive is now a reality! WITI is working with Women Impacting Public Policy (WIPP) and Office Depot to ensure registering to vote can be quick, easy and powerful! All 900 Office Depot locations across America have a space in each store specifically dedicated for voter registration and the www.wedecide2004.com website is up and active. This is a wonderful opportunity for all of us to ensure every tech-savvy and business-savvy woman takes five minutes and registers or re-registers to vote. And we need to ensure that every employee of a woman-owned business is also registered as well. WIPP will use the number of hits to the www.wedecide2004.com website to show the press and politicians that tech-savvy and business-savvy women and those they influence truly are the deciding swing vote in 2004. Go to www.wedecide2004.com and register or re-register. Attach the www.wedecide2004.com link with a quick note to your employees, friends and business acquaintances encouraging them to register or re-register at www.wedecide2004.com. Just attach the note and send it to your e-mail address book. Join the celebration of the 84th Anniversary of Women's Right to Vote by attending the "WE DECIDE!" National Luncheons on August 18th. With 21 locations across America, this will be a tremendous opportunity to highlight the gains women have make in the voting booth and in business. More information is available at www.wedecide2004.com. The San Jose BioScience Incubator & Innovation Center (SJBIIC) provides scientists and entrepreneurs access to a state-of-the-art facility and valuable business development services that enable them to grow and scale successful businesses within a collaborative, entrepreneurial community. Find out more: http://www.wtc-sf.org/biosanjose.html. An Exclusive Network for Executive Women! - Are you an Executive Woman who wants the opportunity to get together with other executive women to share solutions, access connections and influence top level executives in industry? WITI has now launched WITI GEN for Executive VPs, Presidents, Chairman and Board members who meet GEN membership requirements. GEN Teleclasses, led by Barbara Annis exclusively for WITI GEN members, will begin this September. If you want to be considered for a GEN membership, please complete the application and someone will get back to you within 3 days of receiving your application! VERITAS Software Corporation (NASDAQ: VRTS) is headquartered in Mountain View, CA, and employs more than 6,500 people in 40 countries. With annualized revenues over $1.77 billion in 2003, VERITAS Software ranks among the top 10 software companies in the world. Through its award-winning and market-leading products focused on business efficiency and continuity, VERITAS Software provides the building blocks for utility computing. Search for Veritas jobs on WITI4Hire. This position requires a senior, innovative individual to lead the definition of a long-term research agenda for Trustworthy Computing. Identify directed research problems and promising proactive approaches to Trusted Computing that are beyond the organization's current business unit product planning cycles. Establish domain leadership by publishing papers in peer-reviewed journals and magazines. Make original contributions in the field of trusted platform technologies. File patents. Establish working relationships with potential collaborators in industry. Author proposals for collaborative research and drive internal ratification processes. Lead research collaborations with key academic researches.